Izzy Scane drives the ball down the field. The freshman scored three goals in NU’s 17-13 loss to Maryland. 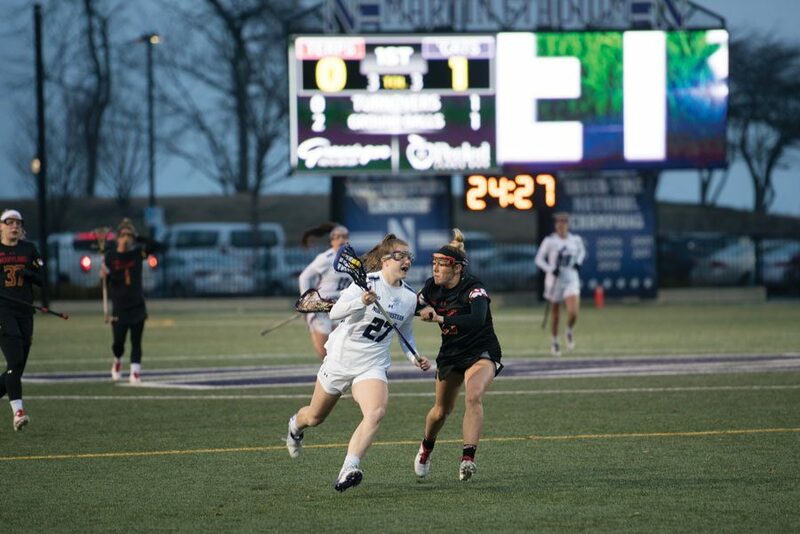 Despite the 24 goals evenly traded between the two top-five ranked teams in the first 47 minutes, the hour-long lightning delay that moved the last 13 minutes indoors and the six-goal performance from senior attacker Selena Lasota, all that mattered Thursday was that Northwestern lost its chance to claim the 2019 regular season Big Ten Championship. The No. 5 Wildcats were tied with No. 2 Maryland at twelve when a lightning strike moved a home lacrosse game indoors for the first time in the history of the program. After a chaotic scene that featured NU representatives ranging from athletic director Jim Phillips to baseball infielder Alex Erro preparing Ryan Fieldhouse to host the final minutes, the Terrapins (15-0, 7-0 Big Ten) scored three goals in just over five minutes to win 17-13 against NU (9-4, 3-1) and continue their undefeated season. In the final 12 minutes of the game, Maryland recovered all four ground balls, took seven of the last 11 shots and drew seven fouls on a team playing its first close game against a Big Ten opponent all season. The Cats missed four of the five shots they took in the indoor portion of the contest, though they lost three additional chances after the officials reversed three different foul calls from against the Terrapins to against NU. Since the Cats weren’t able to keep the lead they held for most of the first half, they dropped into a tie for second place in the Big Ten with two conference games left in the season. Maryland hasn’t lost against a Big Ten opponent in the regular season since it first joined the conference in 2014. With Thursday’s result, NU likely won’t receive a regular season title or the top seed in the Big Ten Tournament this season. NU gave a more competitive showing this time around than it did against the Terrapins last year, when it scored only seven and allowed 14 goals in the first half of a 20-16 loss. Amonte Hiller attributed the team’s initial success this year to the play of senior goalie Mallory Weisse — who was in net the entire game despite not starting a game all season — and sophomore midfielder Brennan Dwyer’s ability to win the majority of the team’s draw controls. And then lightning struck. During the hour-long break right in the middle of a tightly-contested game, every player went back to their own locker, sitting quietly before Amonte Hiller addressed the team. It was the Terrapins who responded, Amonte Hiller said, showing how they’ve dominated the conference for five seasons.